Engwall, Mats; Jerbant, Anna: The resource allocation syndrome – the prime challenge of multi-project management? ; in: International Journal of Project Management, Vol. 21 (2003), No. 6, pp. 403-409. Engwall & Jerbant analyse the nature of organisations, whose operations are mostly carried out as simultaneous or successive projects. 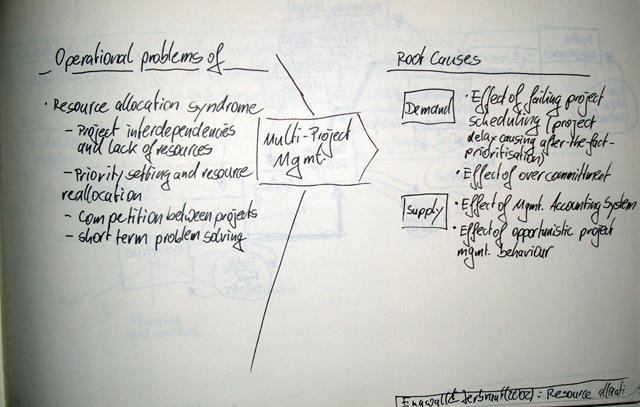 By studying a couple of qualitative cases the authors try to answer why the resource allocation syndrome is the number one issue for multi-project management and which underlying mechanisms are behind this phenomenon. The resource allocation syndrome is at the heart of operational problems in multi-project management, it’s called syndrome because multi-project management is mainly obsessed with front-end allocation of resources. This shows in the main characteristics: projects have interdependencies and typically lack resources; management is concerned with priority setting and resources re-allocation; competition arises between the projects; management focuses on short term problem solving. 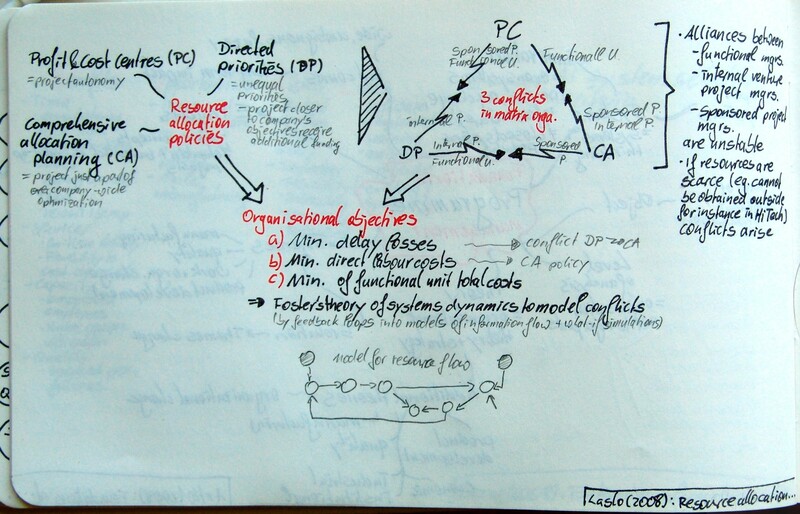 The root causes for these syndromes can be found on both the demand and the supply side. On the demand side the two root causes identified are the effect of failing projects on the schedule, the authors observed that project delay causes after-the-fact prioritisation and thus makes management re-active and rather unhelpful; and secondly over commitment cripples the multi-project-management. On the supply side the problems are caused by management accounting systems, in this case the inability to properly record all resources and projects; and effect of opportunistic management behaviour, especially grabbing and booking good people before they are needed just to have them on the project. Aaltonen, Kirsi; Jaako, Kujala; Tuomas, Oijala: Stakeholder salience in global projects; in: International Journal of Project Management, Vol. 26 (2008), No. 5, pp. 509-516. In their 1997 article, Mitchell et al. define stakeholder salience as „the degree to which managers give priority to competing stakeholder claims“. Furthermore, Mitchell at al. 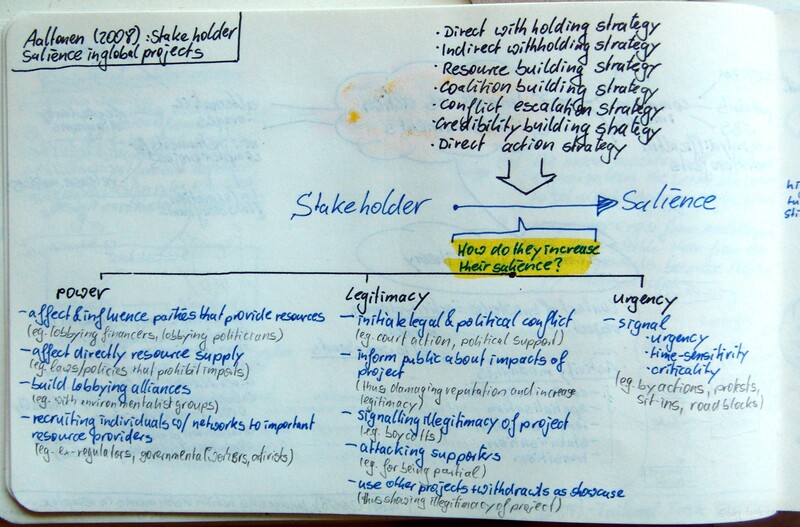 describe how the salience of a stakeholder is defined by three characteristics – (1) the stakeholder’s power to influence the firm, (2) the legitimacy of the stakeholder’s relationship with the firm, and (3) the urgency of the stakeholder’s claim on the firm. 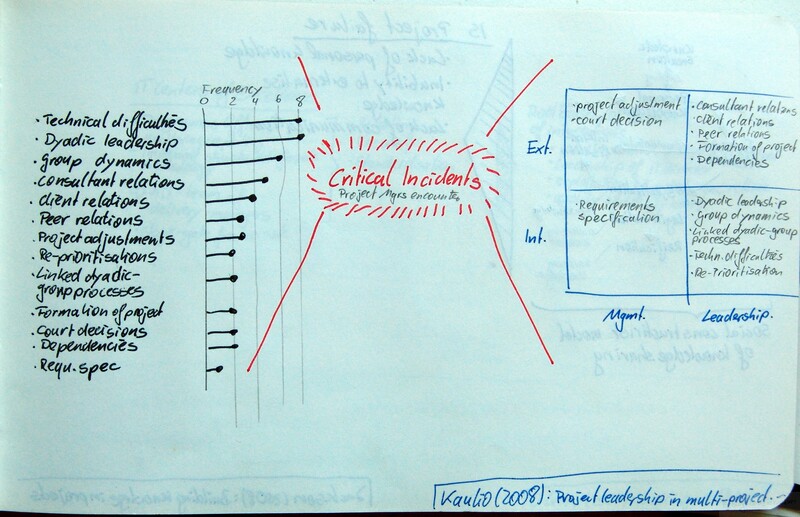 The tactic used to increase urgency was signalling urgency, time-sensitivity, and criticality of decisions, e.g., by staging direct actions, protests, sit-ins, road blocks.